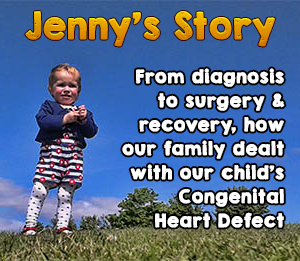 Jenny’s story is typical of a child diagnosed with CHD (Congential Heart Defect), and what their family goes through. These four posts may come in handy for anyone who’s dealing with these issues, or anyone who wants to know more what happens after a diagnosis of heart failure is made. If you’re going through something similar and want to chat or ask any questions, feel free to get in touch.